The computational power of networks of small resource-limited mobile agents is explored. Two new models of computation based on pairwise interactions of finite-state agents in populations of finite but unbounded size are defined. With a fairness condition on interactions, the concept of stable computation of a function or predicate is defined. Protocols are given that stably compute any predicate in the class definable by formulas of Presburger arithmetic, which includes Boolean combinations of threshold-k, majority, and equivalence modulo m. All stably computable predicates are shown to be in NL. Assuming uniform random sampling of interacting pairs yields the model of conjugating automata. Any counter machine with O(1) counters of capacity O(n) can be simulated with high probability by a conjugating automaton in a population of size n. All predicates computable with high probability in this model are shown to be in P; they can also be computed by a randomized logspace machine in exponential time. Several open problems and promising future directions are discussed. Supported in part by NSF grants CCR-9820888, CCR-0098078, and CNS-0305258 (Aspnes), by ONR grant N00014-01-1-0795 (Diamadi), and by NSF grant CSE-0081823 (Fischer and Peralta). 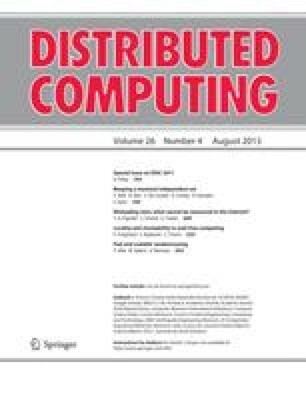 A preliminary version of this paper appeared in the proceedings of the 23rd ACM SIGACT-SIGOPS Symposium on Principles of Distributed Computing, St. John’s, Newfoundland, Canada, July 2004.